Roomba may be synonymous with robotic vacuum cleaners, but LG and Neato Electronics have just announced two new devices to challenge the Roomba's claim to the robot vacuum throne. As reported by Akihabara News, LG’s robot contender, the Roboking, is the sleekest looking robot vacuum yet. 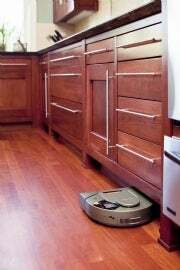 At a less than 90 millimeters in height (compared to the Roomba 570’s 139mm and the previous Roboking’s 130mm height) this new robotic vacuum can go under just about anything. The new Roboking runs quieter: Its noise output now stands at 50 decibels, down from the previous model's 63 decibels. Other features include a second camera for more accurate mapping, resulting in a 30 percent decrease in cleaning time over the previous model. Meanwhile, Silicon Valley’s Neato Electronics has developed the Neato XV-11. While not as sleek looking as the circular Roomba and Roboking, the Neato’s D-shape is said to better clean room corners. At 4 inches (101 mm) in height, the Neato rivals the stoutness of the Roboking but features a sizable .69 quart dustbin to address the common complaint of small bin size in some Roomba models. And it's designed to clean both floors and carpet. The Neato uses what the company calls its "Room Positioning System" (or RPS) technology to map an area 4 meters in diameter, recognize any objects higher than 4 inches and clean accordingly with no bumping required. Using SLAM (simultaneous localization and mapping) technology coupled with path-planning algorithms, the Neato can clean a room with a precise back-and-forth pattern rather than the zig-zag scanning path of a Roomba. While the Roomba comes in various models ranging from $150 to $600, the Neato XV-11 comes in one $400 flavor and will be available in February 2010. The Roboking was announced only in Korea, and LG has yet to announce a price or US release date.